Asian countries are known for its vast natural resources with a wide variety of medicinal plants and herbs. In fact, most health websites feature herbal medicines in curing most of the health problems. Euphorbia Hirta is among the most potent herb in the list of herbal medicines that can be found in health articles over the net. Tawa-tawa, with a scientific name Euphorbia Hirta, is commonly found in any neighborhood in tropical areas.In the Philippines,this plant can be found almost anywhere growing with common bushes and grass.In other countries,tawa-tawa is called the "asthma weed" for its known efficacy in curing asthma. Tawa-tawa is known for its analgesic,antipyretic, anti-inflammatory and anxiolytic properties. It contains gallic acid,quercetin, triacontane, cetyl alcohol,phytosterol, phytosterolin, jambulol, melissic, palmitic and linoleic acid. It also has euphorbianin,leucocyanidol, camphor, quercitrin and quercitrol. Vitamin contents of tawa-tawa plant includes ascorbic acid, thiamin, riboflavin and niacin. 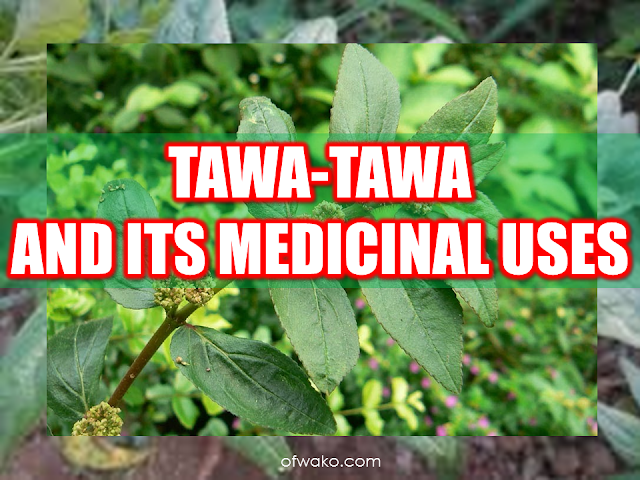 The different parts of the tawa-tawa plant have a variety of medicinal uses. For treating patients with asthma, the white resin is mixed with drinking water to alleviate asthma symptoms. Dried leaves made like a cigar can also be used. For other instances, the plant is boiled to make a tea for the asthma patient. For the treatment of dengue fever, making tea from the whole plant without the roots is a potent cure. For the common fever, the tea made from boiling tawa-tawa roots is being used. The same treatment is used for those with loose bowel movement or diarrhea, making a tea from the roots has the same medicinal effect. Tawa-tawa resin can be used for the treatment of ringworm. The resin is applied to the affected area directly. It can also be used for the treatment of sty (kuliti). You can apply the resin to the affected area. For boils, crushed or minced tawa-tawa leaves can be applied to the affected part of the skin. You can also use the same for treating open wounds. For lactating mother, drinking the tea made from the plant can increase the production of milk in the mammary gland. The tea made from boiling the fresh tawa-tawa leaves can normalize high blood pressure and also good for diabetes. Select fresh tawa-tawa leaves(or roots) and wash it thoroughly with water. Put it in a saucepan or any non-aluminum pan and put enough clean water proportionate to the number of leaves. Boil it for 15 minutes and let it cool. Strain the tea to remove the plant residues. Drink 3 times a day or you can use it as a substitute for drinking water.